Step 1: Decide what courses you want to take, look at the timetable and take a note about where the courses will be held. In our timetable you will see where the dance classes will be held. The courses have different participation fees, depending on where the course is held. 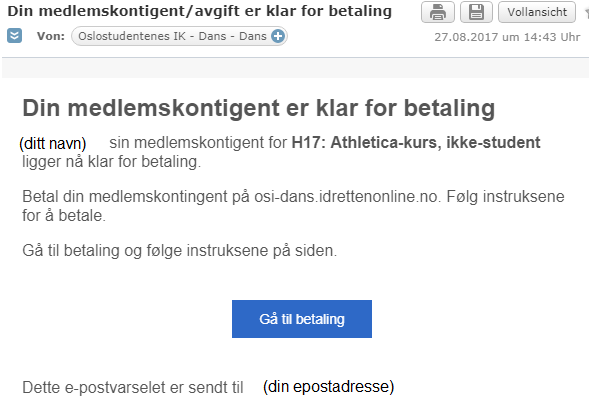 If you are going to take one or more courses that are NOT held at an SIO Athletica Center, you must register either in the "H19: Non-Athletics Course, Non-Student" or "H19" : Athletica Course, Non-Student ". If you only want to take one course held at an SIO Athletica Center , or if you want to take more courses that are all held at an SIO Athletica Center, you must register in the member registration (as in Step 3) Either in the group "H19: Non-Athletica course, Non-student" or "H19: Athletica course, Non-student". Summary: If at least ONE of the dance courses you want to take is NOT held at Athletica, the NON-Athletica fee will apply to you. Go to membership registration. You need paid membership in OSI Dance to be allowed to attend our dance classes + social dance / leisure. Fill out the form and press "next"! On the page that follows, select which group to belong (depends on which course to attend - check the timetable if you are uncertain). The application is now being processed by our member responsible. Within a few days, you will receive information by email about how to pay your membership. If you have any questions in the meanwhile please feel free to contact us by email. If your payment information email does not come, remember to check your spam filter! Note: You can only take this step after you have been approved as a member. After you submit an application for membership, it will be processed by our system administrators. Please wait a couple of hours before signing up for a course. Click on "Login" in the top right corner. Enter the same email address that you used to sign up as a member and fill in the captcha. Click on "send me new password". A one-time password to log in was sent to your email. Check your email and enter the one-time code. Then select a password that you want to use to log in to our pages. Click "save and log in". Your e-mail address is now in the top right corner, which means you are logged in as a member. Go to our event calendar. Find the courses you want to sign up for. In the following example we will show an example enrollment on the course "Boogie Woogie 1". In the picture below you will see the arrangements calendar, which shows all courses. Find the last day of the course, called "påmelding" (enrollment). The event that is on the last day is just a symbolic date, since it is the last day of the course. You register for the course by symbolically attending the last day of the course. We use this calendar feature course announcements, because it is the most practical text-friendly opportunity right now. If we wanted to set the first course date as the date of registration, it would not be possible for people to sign up after this date is over. The system of the calendar is actually made to sell access to football matches, to cabin trips, workshops, or anything. Click the blue button on the right called "sign me on". In couple dancing classes, choose whether you are a "fører", meaning leader (traditionally men's role) or if you are "følger", meanding follower (traditionally ladies). In group dance courses, just select "kursdeltagelse", meaning "class participation". The name of your profile is automatically displayed. Press the blue button "next". on the next page, press the green "Confirm Login" button. On the next page it says "Your registration has been confirmed". This is called a "billett" (Ticket). We in OSI Dans only use the same registration system as other events. The "tickets" are only the solution we use for our members to sign up for a course. The "Ticket" you get out of enrollment on course does not require you to do anything about it. You get as many tickets as the number of courses you have signed up for. You must also receive a confirmation email for the enrollment on the course. Return to the event calendar (in the top menu: Events -> kalender). Sign in the same way on each course you want to take. Click on the button. You will be forwarded to the website with a form confirming the correct fee. On the next page you will need to enter your information again. Be sure to tick the box "Jeg har lest Kjøpsbetingelser og godtar disse." (meaning "I have read the Terms of Purchase and accept these"), and click on "Go to Payment". You will then be forwarded to a bank solution that you can pay with MasterCard or VISA.